Twin Peaks returns to the airwaves in one month. ONE MONTH! After 26 years! While you wait out these last few weeks, get fully prepared for the craziness to come by completely immersing yourself in a Twin Peaks state of mind. We’ve got a list of suggested re-watches, forgotten pop culture nuggets, and more. Well, duh. Look, we know this is a bit straightforward for these types of lists, but you know you have no chance of having even the slightest clue as to what’s going to happen in the new season unless you sit back and rewatch the old ones (and the movie). If you haven’t already gone through the original 29 episodes, plus the pilot, plus the feature film, you have just enough time to start now and watch everything at a semi-normal pace. Wait much longer and you might be in danger of some pie-and-coffee fueled all-nighters (which wouldn’t be the worst thing ever). Before he ventured to Twin Peaks, David Lynch explored a picture-perfect small town that’s hiding some terribly dark and twisted secrets in Blue Velvet. 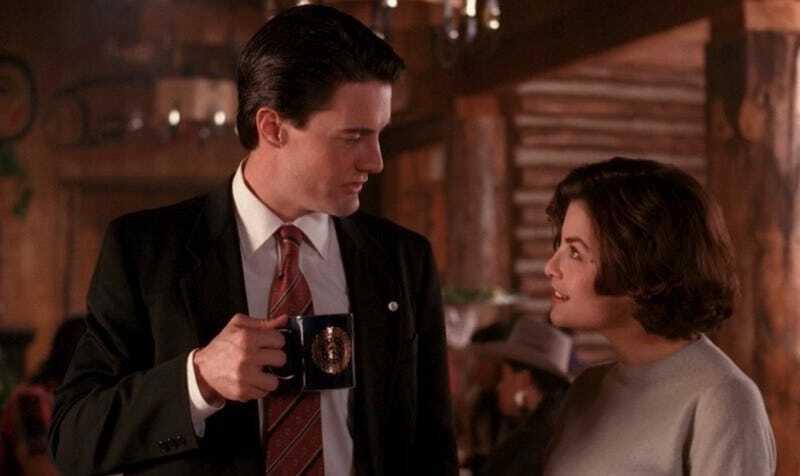 Future Agent Cooper Kyle MacLachlan plays a naive college student who becomes drawn into the seediest of underbellies, and the film shares other actors, themes, and character types with Twin Peaks—arguably even more so than with any other Lynch film. This is the wacky, 1950s-set, TV-themed comedy that David Lynch and Mark Frost made for ABC a year after Twin Peaks ended, starring Twin Peaks alums Miguel Ferrer and Ian Buchanan. It never caught on with the network—only three of its seven episodes made it to American airwaves—but it has since become a cult classic for obvious reasons. The bad news is that in order to watch a non-pirated version of On the Air, you’ll need the determination of a seasoned VHS collector, a pocket full of cash, and a working VCR. The good news is, YouTube exists. Whyyy is this certifiably weird Wes Craven movie—about a kid who sneaks into the ramshackle home of his creepy landlords, only to discover a pack of feral children and golden treasure hidden within—on this list? It came out in November 1991, just a few months after Twin Peaks vanished into the Black Lodge, and it reunites the show’s kookiest couple: Big Ed and Nadine, a.k.a. actors Everett McGill and Wendy Robie, who appear to be having an absolute blast playing the landlords with evil yet campy flair. Another head-scratcher, until you check the cast list of Robert Wise and Jerome Robbins’ 1961 Best Picture-winning musical. Long before Richard Beymer played Great Northern Hotel and One Eyed Jacks owner Benjamin Horne, he played the love-struck Tony. And long before Russ Tamblyn played Hawaii-obsessed shrink Dr. Lawrence Jacoby, he played Tony’s snap-happy best friend, Jets gangleader Riff. According to a 1990 Los Angeles Times article, the West Side Story connection was merely a casting coincidence; Lynch’s co-creator Mark Frost says they just happened to be the best actors who tested for their roles, and their characters never do interact much. However, it’s still fun to see them as fresh-faced crooners 30 years before their TV stints in the eeriest corner of the Pacific Northwest. A memorable Twin Peaks spoof inevitably occurred when Kyle MacLachlan hosted Saturday Night Live, and other shows (including the geographically similar Northern Exposure) also paid homage to the pop culture phenomenon. However, Cookie Monster rules, as does that sassy talking log, so Sesame Street’s “Twin Beaks” wins the day. That said, and as much as we love Alistair Cookie, this episode of Psych—which aired in 2010, making its Twin Peaks love even more left-field and wonderful—is a very close second. Not only do multiple Twin Peaks stars make guest appearances, the murder mystery at the center of the episode is an obvious hat-tip—along with several other references, including a diary mentioning someone named “J,” a sawmill fire, and (of course) a diner that serves absurdly delicious pie. Though you won’t learn anything about the third season from Mark Frost’s recent dossier-style book, The Secret History of Twin Peaks, is still a fun and intriguing read for fans of the show. If you really want to go all in, pick up a copy of The Secret Diary of Laura Palmer, which was written by Lynch’s daughter, Jennifer, and released in 1990 at the height of Twin Peaks insanity. Diane, I had this on cassette tape back in the day. Now, of course, you can wrap your ears around Angelo Badalamenti’s iconic soundtrack for the show and Fire Walk With Me via any number of formats, including snazzy vinyl aimed at collectors. If you can’t get enough of Julee Cruise’s dreamy vocals—she’s the chanteuse who serenades at the Roadhouse—you can also pick up her 1989 solo release, Floating Into the Night, which was entirely co-written by Badalamenti and Lynch. Coffee you can find on any block. It’s a bit more of a challenge to track down the perfect pie. Damn Fine Cherry Pie: And Other Recipes from TV’s Twin Peaks may be unauthorized, but it’s cleverly edited (there are also how-tos for “Mrs. Tremond’s Creamed Corn Chowder” and “Mexican Chihuahua Churros”) and written by the founder of the UK’s Twin Peaks festival, so it’ll appeal to your fan sensibilities as well as your taste buds.